– A young patient of age 27 years from Indore (MP) was on the medical treatment since last 2 years. He was grade IV with a large area of baldness in vertex area. He wants hair transplant for the front as well as a vertex in the single sitting. On examination, he has good donor area with the density of 92 grafts per square centimeter. His laxity is also good. So we decide to take 3500 grafts by FUT. Surgery done under local Anesthesia, PRP is also done and grafts were placed in the plasma to provide them biological atmosphere. Surgery went uneventful and he is discharged in the evening on the same day. Post-operative period was comfortable. We use post-op ropivacaine block in the sutured area to reduce discomfort in the immediate post-operative period. We took regular follow-up of the patient after 24 hours, 10 days, 1 month, 3 months, 6 months and so on. A patient comes to us with a smile on his face after 7 months 10 days as he is happy with the early result, we all know that complete result may take 10 to 12 months so we expect even better for him. 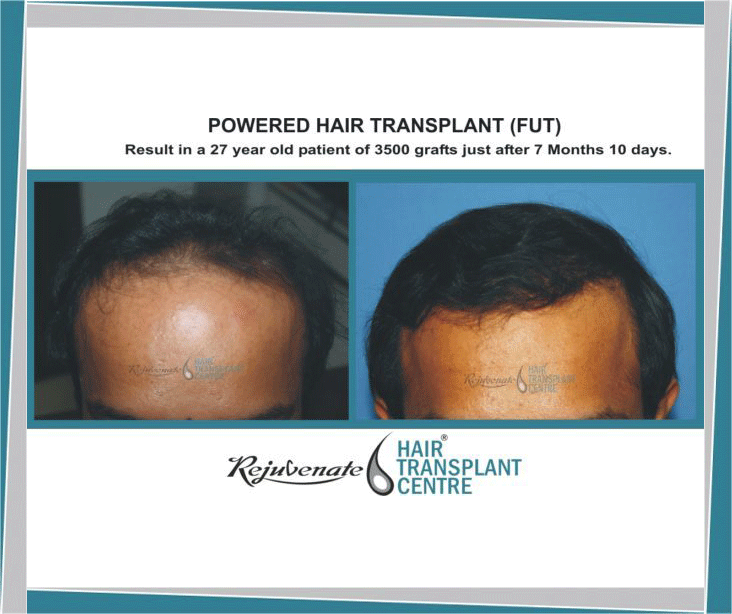 You can compare photographs of the patient-preop, just after the operation and post-op results of powered hair transplant.